What makes this the best-selling text on Game Theory? Games of Strategy, famous for its simple yet accurate exposition and its great examples and exercises, has been extensively revised for this Fourth Edition. The key to its broad success is that the authors assume no prior knowledge of game theory and present the material in the most accessible way possible. With new and improved features and compelling end-of-chapter exercises, this Fourth Edition of Games of Strategy continues to engage students around the world. This Fourth Edition includes expanded coverage of Behavioral Economics and Experimental Economics (Chapters 3 through 7) to ensure that students are kept up-to-date on these hot topics in game theory. In addition to an extensive revision of every chapter, there is also an updated coverage of Cheap Talk, Information, Repeated Games, and Collective Action and Incentives, among other topics. The authors have added even more new end-of-chapter exercises to this Fourth Edition. The solutions to half of the exercises are available for students on the free accompanying website. 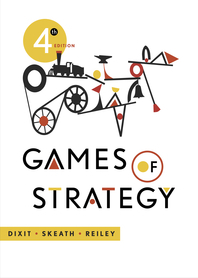 Games of Strategy, Fourth Edition, allows students to explore a variety of topics from the TV show Survivor to the lack of .400 hitters in modern baseball, from Kmart versus Toys-R-Us to side-blotched lizards in California. New to this edition are discussions regarding the U.S. and China Trade Policy and lending to Greece, and an entire chapter devoted to the Cuban Missile Crisis. Students can also delve into issues concerning Student Life, such as grade inflation and why roommates wait for the other to buy the common items (soap, ketchup, etc.) and therefore why they always run out. 1. What Is a Game of Strategy? D. Why Are Professors So Mean? A. Are the Moves in the Game Sequential or Simultaneous? B. Are the Players’ Interests in Total Conflict or Is There Some Commonality? C. Is the Game Played Once or Repeatedly, and with the Same or Changing Opponents? D. Do the Players Have Full or Equal Information? E. Are the Rules of the Game Fixed or Manipulable? F. Are Agreements to Cooperate Enforceable? 1. What Is a Mixed Strategy? A. When Do Strategic Moves Help?